After Bette Davis finished filming two movies in 1939, she returned to her native New England to take a much-needed break. She stopped at an Inn in Franconia, New Hampshire, called Peckett’s-on-Sugar-Hill, and fell in love. Bette fell in love with Arthur Farnsworth, the assistant manager at the inn, and they were married in 1940. Sadly, “Farny,” as she called him, died a short three years later after a bad fall. Bette’s other love was a “shotgun shack” she purchased from the Peckett family. She updated and added onto the shack, turning it into a cozy cottage. 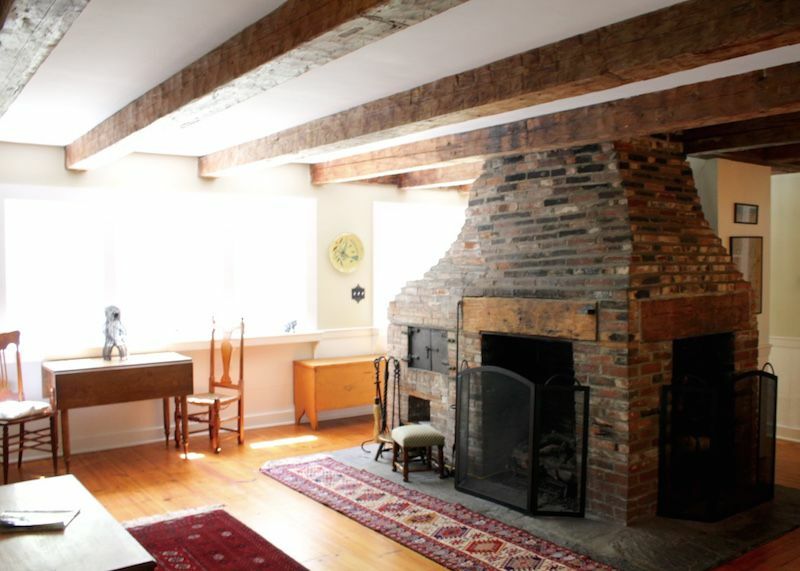 The post and beam cottage has five fireplaces, two in the main dining and living area in addition to one in each of three of the cottage bedrooms. The fireplaces, original wide plank pine floors and rustic overhead beams bring to life the treasured features of simpler times. 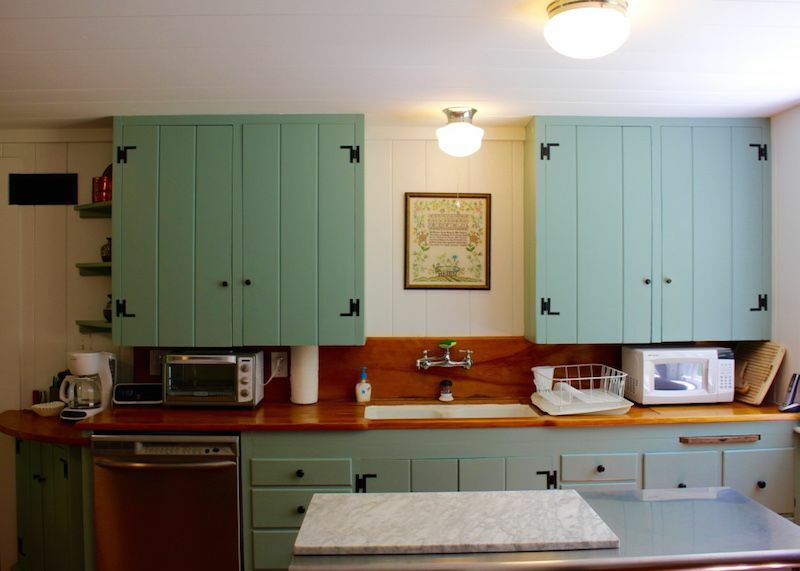 Come enjoy the historic nature of Butternut Cottage with a hint of Bette Davis memorabilia bringing the past, present and future to life in any season. He set out to restore the house, adding as many original pieces and as much Davis memorabilia to it as he could find. She earned 10 Oscar nominations over the course of her career and won two (for Dangerous and Jezebel). I especially love the photo of her in front of the cottage fireplace because it’s so unlike the Hollywood glamour shots we usually see. 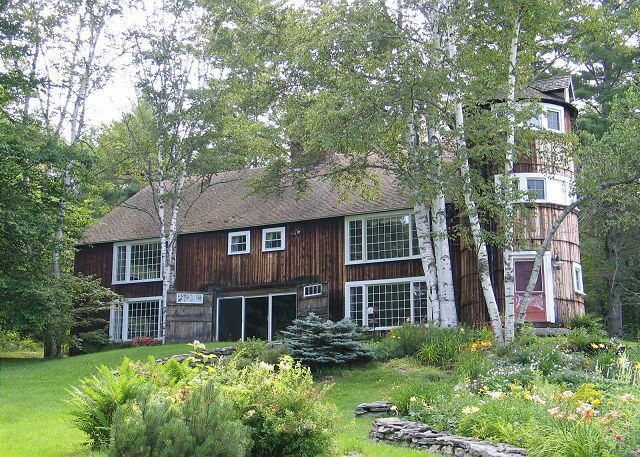 She had an old barn dismantled in Vermont and used it to build Butternut Lodge higher up on her Sugar Hill property. This inviting Sugar Hill home, built by actress Bette Davis in 1940, retains the character of that grand era, while accommodating family and friends in modern style. 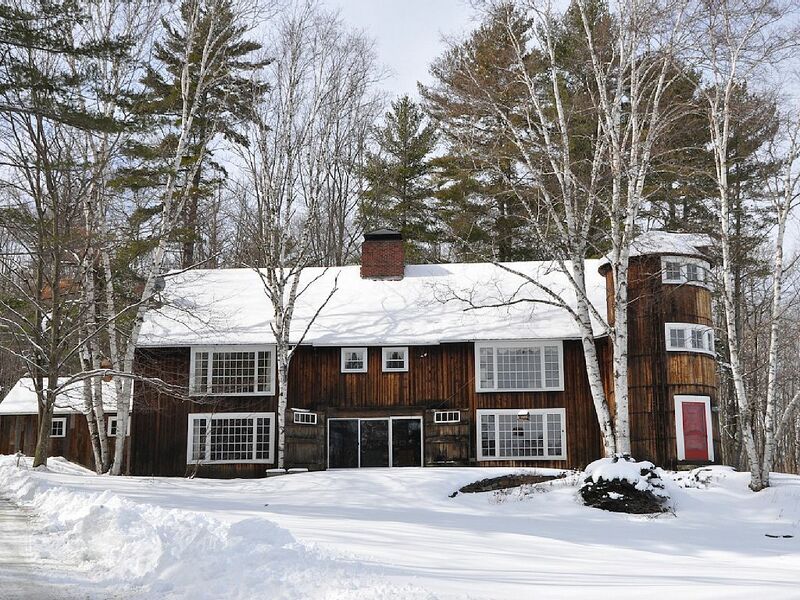 Located three miles from Franconia on 22 private, wooded acres overlooking the White Mountains, it is attractively furnished with country antiques, accessories, and artworks. The lodge has four bedrooms. The lodge sits on 22 private acres. It’s easy to see why she fell in love with this area. Gorgeous! P.S. Did you see Katharine Hepburn’s house in Connecticut? The house is adorable. Looks very New Englandy. The lodge sure needs some updating. It reads very late 70s -early 80s with all that floral wallpaper and dusty pink. But it would be worth it for the views! Such as sad story, but I’m glad to see it’s being taken care of now. Some of it is starting to look dated, so hopefully they’ll continue to to update the two buildings. It certainly has a gorgeous view! I love this!! My favorite actress. I can see her walking around and living there. I love that it still looks like it is in the ’40s. Thanks so much for sharing. I have always had great admiration for Bette Davis and fell even more in love with her when I read about her and her great love, Arthur Farnsworth and her Yankee roots. I’ve been to beautiful Sugar Hill and nearby Franconia numerous times and it is truly a beautiful place. In my opinion, the Butternut properties are perfect in the way that I think Bette would be very happy there if she saw them today. Thank you for featuring this treasure. I love the cottage. It looks so peaceful and comfortable. The exterior of the lodge looks nice and rustic, but the inside looks outdated and it doesn’t look like there’s enough lighting. I’m sure it won’t take much to fix it up. Truly a quiet retreat for a woman who was very much in the public eye. I am sure she enjoyed perfect peace and contentment there among the woods and sounds of nature. Thank you for researching and sharing with us, Julia. She looked so beautiful and very natural. I love where it says she “probably didn’t” push him down the stairs. LOL. Thank you for sharing this piece of familiar history. I am a descendant of the Pecketts and have visited the Butternut lodge numerous times in my childhood. It was lovely to see a place that is dear to my heart featured in a positive way. To your readers, please visit the White Mountains. It’s breathtaking in beauty at every time of year. Several of you are saying the lodge looks outdated. However, I believe they are trying to keep the lodge how it would have looked in the 30’s and 40’s. 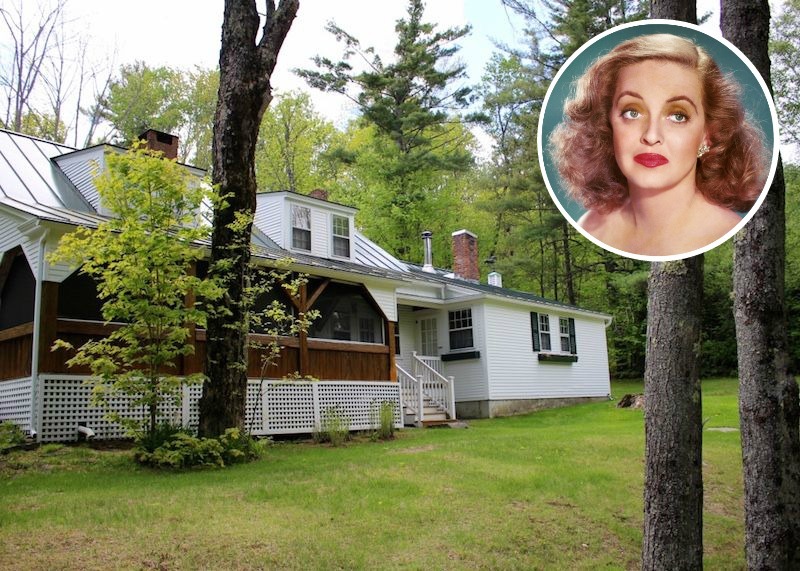 I was so enchanted by the story of Bette and her cottage. I wanted to know more. They knew each other in high school. How sad for her. I hadn’t seen that article — thanks, Susan! It gives a few more details than I had read elsewhere. Had no idea (not thay i know everything ‘Bette’) she had a marriage to Farny, the asst. inn manager. How sweet! What a compoundn wow. Some favs? -the Sage’y green kitchen, huge stone fireplace, and round sitting room. Thanks for sharing this. I remember being near this place as a kid. Love old movies too as you know – so great to get more history and the story behind it! Great piece. Love the old Hollywood too & always curious about their homes..thanks for bringing this one as I hadn’t heard about it before. It’s great that somebody saved this house & history & it can be visited..I’ve been to New Hampshire once & it is so beautiful. As much as I’m not a fan of the floral master in the Lodge, that circular couch?? Straight up 40s Hollywood glam and I’m LOVING it!!! Hi Julia – love your website! Will share it with my own website and FB readers (big audience of wonderful people). Email me if you wish.